Sony announced a couple new HD camcorders you’ll see on the shelves in September. The HDR-CX520V and HDR-CX500V capture 1920×1080 high-definition video, as well as 12-megapixel photos. Both handycams store content on 64GB or 32G internal flash memory, respectively, giving you up to 25 hours of HD video in LP mode. In addition to the built-in memory, content can also be stored externally on a Memory Stick PRO-HG Duo HX media (currently sold separately in capacities up to 16GB, a 32GB card will be available in September). Both the cameras give you the option of 60 frames-per-second output with a compatible HDTV. 3-Way Shake Canceling reduces hand shaking in three directions – vertical, horizontal and laterally. A new feature of face detection, the Sony BIONZ image processor added a Face Touch function. This allows you to touch a person’s face on the LCD display and optimize the camera’s focus, skin color and brightness for that subject even when the subject leaves the scene. 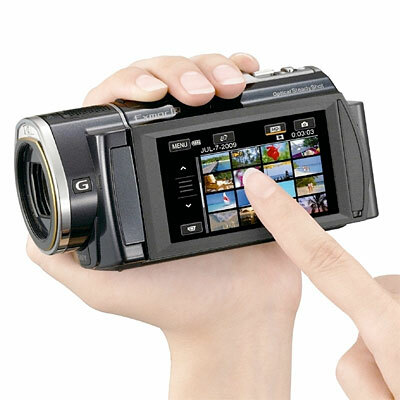 For audio the the cameras feature a built-in zoom microphone with Dolby Digital 5.1-channel surround. What will the HD camcorders cost? The Sony HDR-CX500V and HDR-CX520V, will be priced at about $1,100 and $1,300 respectively.